“How’s it feel to be on the front page of every newspaper in the English-speaking world, even though the other side denies the incident?” Top Gun is so cheesy, it’s like mature cheddar wrapped in a slice of Emmental with some Parmesan sprinkled on top. Yet, when I first saw the movie as a teenager, I loved it. Not for the actors and certainly not for the scenes of sweaty fighter pilots playing volleyball, mind you, but because of the true star of the movie: the wonderful Grumman F-14 Tomcat. 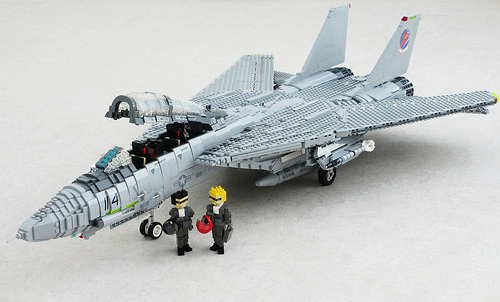 I have been a Tomcat fan ever since and have had at least one LEGO model of a Tomcat for at least 20 years. I have been thinking about building a larger scale aircraft for about two years now. Seeing the excellent 1/18 F-16 by Everblack a few weeks ago, in combination with my ongoing movie vehicle project prompted me to finally have a go. If I was going to bite the bullet, it would have to be a Tomcat and it would have to be the one from Top Gun, cheesy or not. The process was relatively painless. Building an aircraft at a different scale was interesting. Some of the solutions that I’m used to didn’t really work, so I had to be a bit more inventive. However, the larger scale does have advantages. I had a lot more room to work with, which meant I could incorporate a lot of techniques that I normally don’t have room for. It is 108 studs long, excluding the nose probe, and with the wings in their most forward position has a wingspan of 110 studs. This isn’t small by any means, but it’s also not quite so large that I had to worry too much about structural issues. I know that there are some readers out there who are of the opinion that I do blog rather many of my own models and, admittedly, I have blogged a fair few. I build a lot more than the ones I blog though and, be honest, do you think the other guys wouldn’t have blogged this if I weren’t one of the contributors? No need to excuse yourself over this. You’ve shown enough restraint already considering almost everything you build is blogworthy anyway. I come here to see the cream of the crop, and this certainly fits the bill, no matter who’s post it is. Carry on. Agree, this is an awesome representation, I wish you had the instructions so I could build one myself! 100% blogworthy Ralph, a truly brilliant build. Great build, and definitely blogworthy. You ask “do you think the other guys wouldn’t have blogged this if I weren’t one of the contributors?”, Yes I think they would have blogged this, and what’s more, I think it would be good if they had done so. Thanks for the comments, guys. I’m glad it’s appreciated.